Stout is a dark beer made using roasted malt or roasted barley, hops, water and yeast. Stouts were traditionally the generic term for the strongest or stoutest porters, typically 7% or 8%, produced by a brewery. In this sense a stout is not necessarily dark in colour because there are also blonde stouts. There are a number of variations including Baltic porter, dry stout and imperial stout. The name porter was first used in 1721 to describe a dark brown beer popular with street and river porters of London that had been made with roasted malts. 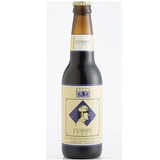 This same beer later also became known as stout though the word stout had been used as early as 1677.